We have a ready stock of a wide variety tapered plug to cater your huge requirement.solitaire overseas is known for providing high-quality Carbon Steel tapered tube plugs and for its quick and timely delivery. We export and supply Carbon Steel tapered plugs all over the world. We have been a leading and the most trusted company providing high-quality Carbon Steel tapered plugs for heat exchangers, coolers, condensers, etc for decades. Carbon Steel Tapered Plugs For SA179 Tubes, SA178 Tubes, SA192 Tubes, SA210 Gr A1 Tubes, A334 Gr1 Tubes, A334 Gr6 Tubes . Carbon Steel Tapered Plugs For Heat Exchangers Are Used To Seal The Leaking Tubes In Heat Exchangers / Condensors / Boilers / Coolers ,SA179 Tubes , SA178 Tubes , SA192 Tubes , SA210 Gr A1 Tubes , A334 Gr1 Tubes , A334 Gr6 Tubes . Etc. Carbon Steel Tapered Plugs Offers Low-Cost Maintenance And Fastest Method To Seal The Leaking Tubes. The Uniform Taper And The Smooth Surface Finish Assure Positive Sealing With Minimum Installation Force. Carbon Steel Plugs For Heat Exchangers Are Used To Seal The Leaking Tubes In Heat Exchangers / Condensers / Boilers / Coolers, SA179 Tubes, SA178 Tubes, SA192 Tubes, SA210 Gr A1 Tubes, A334 Gr1 Tubes, A334 Gr6 Tubes, Etc. Carbon steel is a metal alloy Is a combination of two elements – iron and carbon. The amount of carbon in the metal alloy depends on the requirements of the user. If There Is An Increase In carbon content, the metal becomes stronger & harder, but less ductile And Increases difficulty to weld. Also High Carbon content lower’s the melting point and temperature resistance, lower carbon content increases the melting point and temperature resistance.Carbon steel is used in constructions, automobile, refrigerators, coolers, heat exchangers, coolers, condensers, etc. 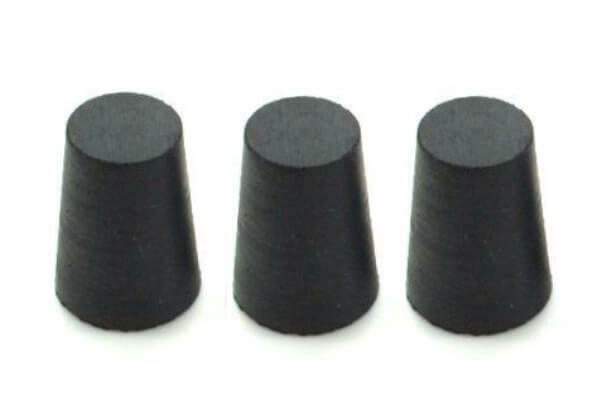 We are one of the leading exporters, suppliers and stockists of Carbon tapered plugs. Having a stock of more than 10000 Carbon tapered plugs, we can deliver a huge quantity of carbon steel tapered tube plugs as and when required. we have a production capacity of more Than 1000 Carbon Steel plugs a day, so that we can cater to your large requirements. Carbon Steel Tube Plugs, Carbon Steel Tapered Tube Plugs Exporter & Supplier, Carbon Steel Plugs Exporter & Supplier, Carbon Steel Heat Exchanger Plugs Stockist And Exporter. Want To Buy Carbon Steel Tapered Tube Plugs ? Why Are Carbon Steel Tapered Tube Plugs Used In Heat Exchangers ? Carbon Steel Tapered Tube Plugs For Heat Exchangers Are Used To Seal The Leaking Tubes In Heat Exchangers, Condensers, Boilers, Coolers, Etc. Carbon Steel Tapered Tube plugs are used extensively in heat exchangers . they are used for repairing or fixing leaks heat exchangers. Carbon Steel Tapered Plugs offer low cost maintenance and are highly efficient , they offer fastest way to fix leaks in heat exchangers. We have wide variety of tapered plugs. We are one of the leading exporters, suppliers and stockists of tapered plugs. Having a stock of more than 10000 tapered plugs, we can deliver huge quantity of tapered plugs as and when required . we have a production capacity of more Than 1000 tapered plugs a day, so that we can cater to your large requirements. We have a ready stock of tapered plugs of different materials like carbon steel tapered plugs, stainless steel tapered plugs, titanium tapered plugs, alloy steel tapered plug, inconel tapered plugs, monel tapered plugs, tantalum, hastelloy , copper and copper alloys, nickel and nickel alloys tapered plugs, copper-nickel tapered plugs, etc. available in different sizes.with ready stock of tapered plugs and huge production capacity we provide fastest delivery and quality product to our customers. We even cater to small requirements of our customers. Our tapered plugs are exported all over the world to many industries. Why Choose Solitaire Overseas For Buying Carbon Steel Tapered Tube Plugs? Looking For Exporters & Suppliers Of Carbon Steel Tapered Tube Plugs? Come Right To Us!